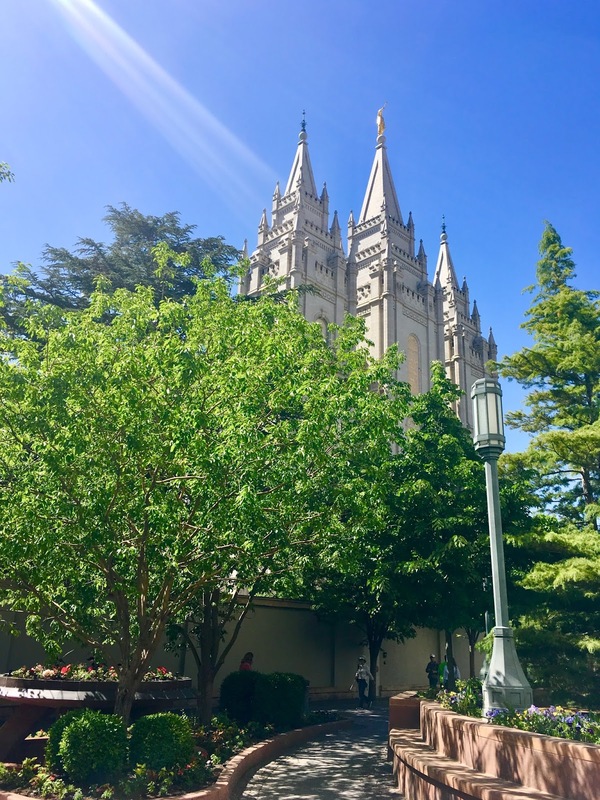 For the first time in our travels, Ed and I visited Temple Square in Salt Lake City, Utah. 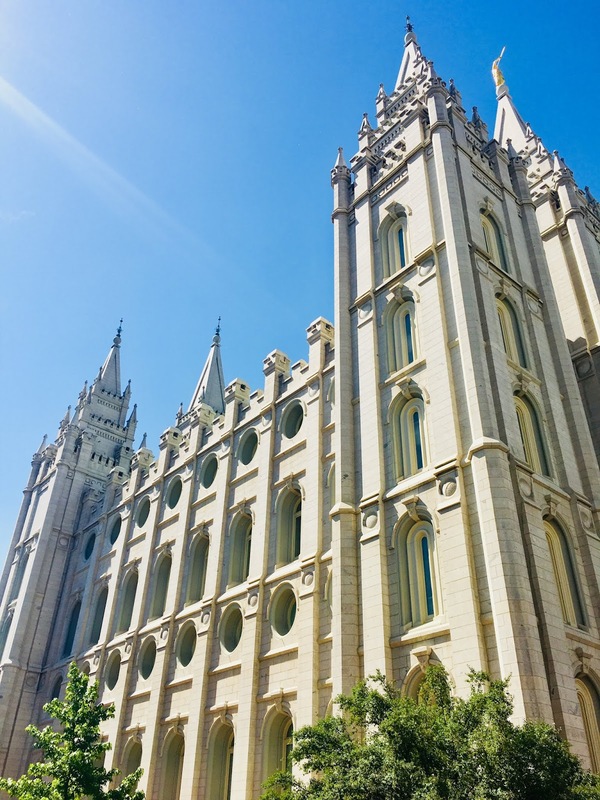 In addition to the Salt Lake Temple, seen here, the 35 acres in and around Temple Square include the Tabernacle (home of the Mormon Tabernacle Choir and Orchestra), The Beehive House (Brigham Young's official residence), The Joseph Smith Memorial Building, The Family History Library, and more. 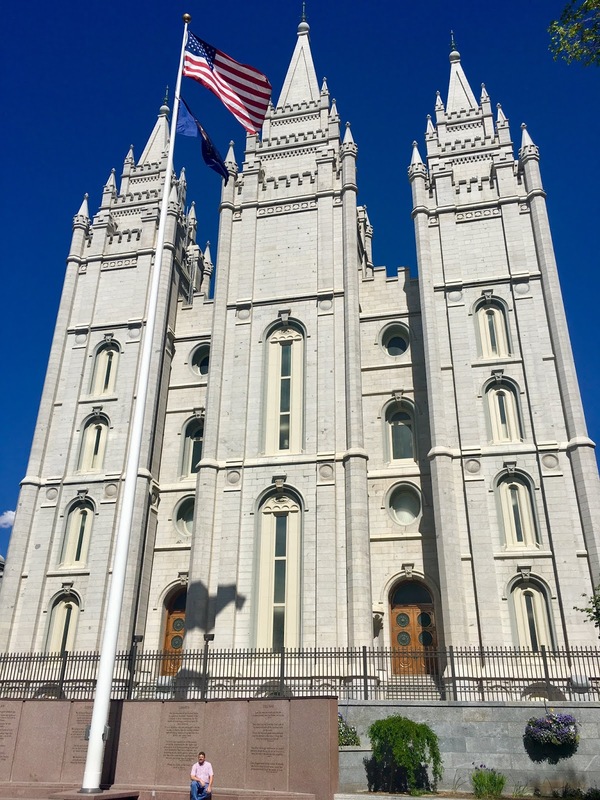 The Salt Lake Temple is the most prominent building in Temple Square. Surrounded by lush trees, flowers, and water features, and the area feels peaceful and serene even though people continue to stream through. There are guided tours and presentations, interactive exhibits, art displays, films, etc. All are free to the public. A sign near the temple says: The temple is used by Church members for marriages and other sacred ordinances designed to strengthen families, both now and for eternity. Begun in 1853, it was completed 40 years later. Granite rock used in its construction was hauled 23 miles by ox-drawn wagons from Little Cottonwood Canyon. The walls are nine feet thick at ground level and narrow to six feet thick at the top. 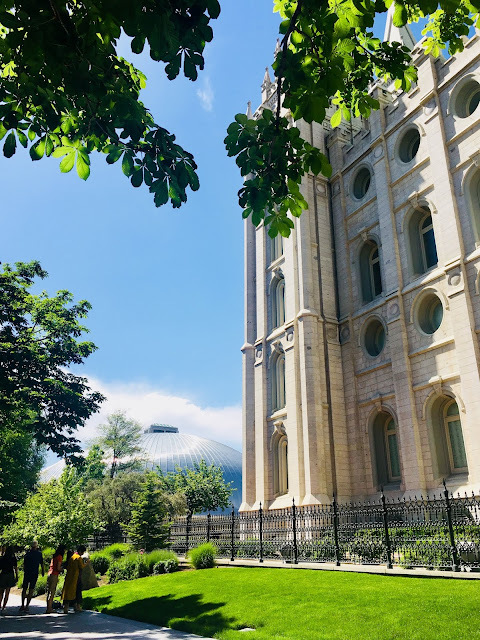 The east enter tower is 210 feet high and is topped by the statue of an angel heralding the restoration to earth of the gospel of Jesus Christ in the latter days. Ed and I have enjoyed what we've seen so far, and The Family History Library, where we've already spent a couple of days, is amazing. It houses the largest genealogical collection of its kind in the world. I've already found several records for my family - including birth records from 1800s Italy for my great grandfather - and I'm looking forward to going back again to delve into even more family history.